What happens when we take your order for a quarter/half or whole beef? When we take your order for a quarter/half or whole beef, we try to give you a date when it will go to the meat processor. When the steer goes to the processor we will call you to get your instructions for how you want your beef cut. The beef will then dry-age in a climate controlled cooler for 7-10 days before being cut. The reason it is dry aged, is that dry-aging helps tenderize the meat. Cutting, packaging and freezing takes another 2-3 days, so your order will be ready for pickup about two weeks after the date the animal went to the processor. 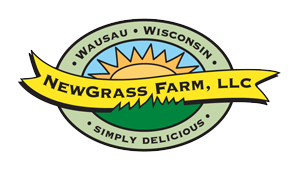 You will pick up the meat at the processor, and at that time, we ask that you pay them for processing and also write a separate check to NewGrass Farm for the beef. Decisions, decisions...Figure out how to have your beef order cut. Read through our guide to selecting your cuts. If you ordered a quarter, what you will receive is commonly called a “split half.” Because, the cuts of meat in the front half differs dramatically from the back half, we evenly divide the cuts between the two to make it a fair offering. This will somewhat limit how you can have your beef cut, as it is a compromise with the other customer, who will be sharing the half. Again, this applies only to quarter orders. If you ordered a half or whole beef, you won’t have to split the cuts. What happens if there is something wrong with your beef? It's wonderful to have a freezer full of beef that you can feel good about eating, unless, of course that beef just doesn't taste good. Unfortunately, there is plenty of poor quality beef on the market, especially grass-fed beef. The reality is that it takes a great deal of skill and the right genetics to finish cattle properly on grass alone. Too many producers take short cuts, offer you a "cheap" price on their beef, but then don't want to assume responsibility if their beef is just not up to par. Yet, the last thing you want to do is spend hundreds of dollars on a large order of beef only to find that it tastes like shoe-leather, and the only thing you can do about it is throw it away. What will your beef cost? The cost is $3.50-3.65/lb hanging weight, depending on the amount. Again, this does not include processing, which runs about $0.70 per pound. The hanging weight is the weight of the carcass, before it is processed into individual cuts. Your take home weight of meat will be about 25%-35% less depending on how you have the meat cut. Quarter: 150-180 lbs x $3.65/lb = approximately $550-650 for the meat, and about $125-$150 for the processing. Half: -300-360 lbs x $3.50 = approximately $1100-$1300 for the meat, and about $250-$300 for the processing. Whole: 600-760 lbs x $3.50/lb = approximately $2100-2600 for the meat, and about $500-$600 for the processing.